We were delighted to be asked by Laura Houldsworth, Executive Editor of House & Garden magazine, to collaborate with her on a talk at this year's House & Garden Festival. The festival is an amazing experience that brings together four leading lifestyle events, The Art & Antiques Fair, HOUSE, Spirit of Summer, and GROW. Held at Olympia London, it is absolutely brimming with inspirational ideas, upcoming trends, and professional advice. There are workshops and talks with industry professionals and an abundance of beautiful interiors and lifestyle exhibits. We always enjoy working with House & Garden and this was no exception! The topic for the talk was 'decorating on a budget'. And while we mostly work with large developers and private clients, we always love a challenge! So we flicked through our photos of past projects and picked out our favourite thrifty tips and tricks. Sometimes it's the simplest, and the least expensive, details that make an interior work. So if you missed us at the Festival, here are our top tips for decorating on a budget. Brighten up a room with a flash of colour - one cushion or throw can make all the difference. You can even raid your wardrobe and see if you have a great shawl or wrap to use as a throw or an old scarf that could be repurposed into a feature cushion. Some expensive looking cushions can really upgrade an interior. A great way of adding a dash of style without splashing out is to make the most of your offcuts. We often put the expensive fabric on the front of a cushion cover and use a less expensive plain fabric on the back. We had some of this gorgeous Missoni inspired fabric left over when covering the headboard so we made up a couple of matching cushions too, combining it with a less expensive fabric on the back. They look great together or you could even use them in another room. A great cost effective way of decorating your walls is with a collection of affordable pieces clustered together in inexpensive frames. We find that by grouping pieces of art together the impact can be so much stronger. Use holiday &amp; family photos mixed with prints for a more personal, budget-friendly, touch. In the words of renaissance artist, El Greco, "Art is everywhere you look for it" - that should be your first rule for finding art on a budget! Here we framed a couple of ammonite drinks coasters to create an expensive looking pairing. This is a simple way to upgrade a room for a more glamorous look without spending a fortune. Your second rule should be: revisit old pieces! This old painting was taken out of its worn frame and popped into a new inexpensive and contemporary frame to give it an update. It's worth looking through junk shop art to see if you can give something a new lease of life. If you're not over looked by neighbours don't worry about curtaining your windows at all. Make the view your focus! Here we just added simple sun blinds to protect the furniture but added nothing else to the windows - the furniture and the view do the talking! Wood slat blinds are an inexpensive window solution, you can screen the outside by dropping them and keeping them open or block out the rest of the world completely for a bit of privacy or a well deserved weekend lie-in. &nbsp;In this bathroom, we used some fabric off cuts to create fake fabric blinds that don't actually drop but add softness to the window. Rummaging around flea markets we often find beautiful and inexpensive pieces that are unique and full of history. We upcycled this little wooden stool to be used as a side table, and the reclaimed pedestal table and settle that we used in this hallway. Each of these pieces has its own distinctive look, won't break the bank, and also reduces your impact on the environment. Sometimes all it needs is a fresh coat of varnish or paint to make it feel new again! Vintage trunks can be used in a myriad of ways - as side tables, bedside tables, coffee tables, at the end of beds and behind sofas. The bonus is you can hide all your bits and pieces away in them too! Family heirlooms, like these quirky cane swivel chairs, can be reused in a more modern setting. We recovered the seat cushions to give them a fresh look.&nbsp; Don't be too quick to dismiss family hand-me-downs! Often vintage items are incredibly durable and hard wearing. All they need is a little bit of TLC and they can quickly become the feature pieces of a room. We all love Ikea. Even we interior designers are regulars to pick up our favourite, Lack shelf! We have used this handy little shelf in every space you can think of! Lack shelves are a perfect (and inexpensive) addition to a kitchen or bathroom to create extra storage areas. We even used one in this tight corner to make a desk/dressing table area, saving on both space and budget. 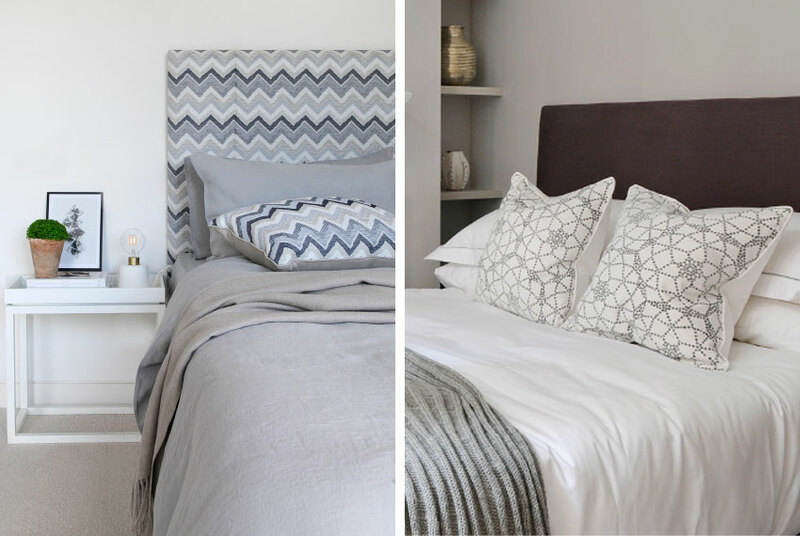 You don't have to cover the whole room in expensive wallpapers or cladding to upgrade your bedroom! Here we created feature walls by using tongue &amp; groove panelling and patterned wallpaper on just one wall behind the bed. This adds texture to your space while also giving the room a chic boutique feel. Converting our old office building into a family home challenged us to make something great on a tight budget. The property featured a commercial looking spiral staircase which, for budget reasons, we couldn't take out. Instead, we transformed it with a fresh coat of paint and added some vinyl flooring on the treads. Despite initially seeming to be a bit of a drawback it actually became the focal point of the house! The buzz of the House & Garden Festival is definitely not to be missed! With so many incredible exhibitors and experiences, it's worth popping down even for an afternoon. It runs until the 24th of June, you can book tickets here. 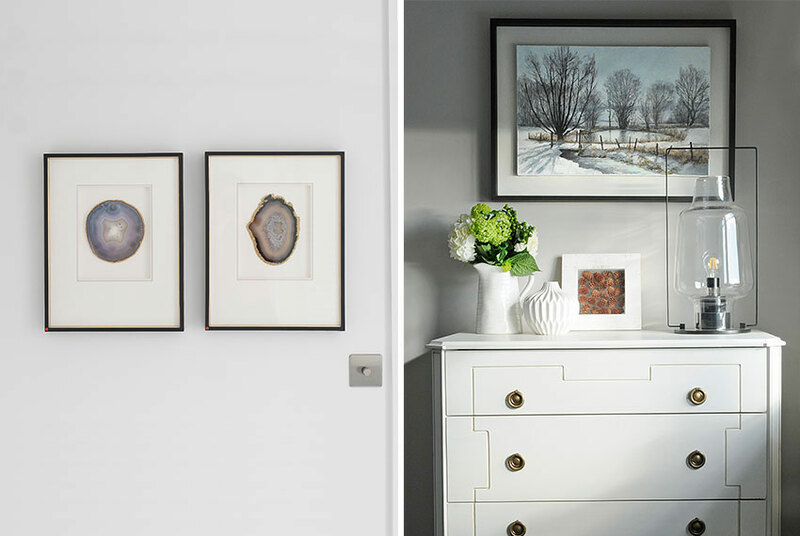 Browse our portfolio for more of our past projects and further interior inspiration.